On Sunday, September 17, 2017, RISD celebrates Constitution Day with a local session of “Handwriting the Constitution,” a NYC-based, global art project. Join our creative scribal workshop at the Fleet Library, 15 Westminster Street, 3-7 p.m. Learn about this founding document by copying out the text, and/or create “friendly amendments” to broadcast your vision of an ideal society. We’ll combine everything into a collage, to post in the library and online. We provide the Constitution and writing materials. You are welcome to bring your own dry media. 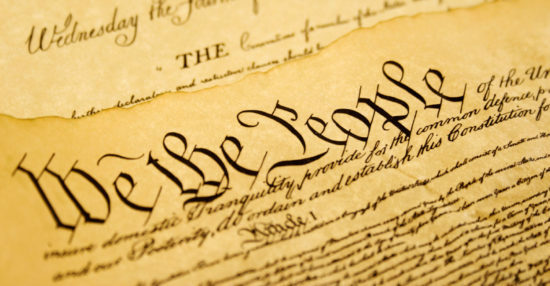 Participants will receive “We the People” tickets for Constitution Cake & Coffee, compliments of the Portfolio Café. Also, maps will be available for a Walking Tour of Constitutional Providence. The late Senator Robert C. Byrd of West Virginia and Congress’ unofficial constitutional scholar, believed that American students lack significant knowledge regarding the United States Constitution. In December 2004, he proposed an amendment that was passed by both the House of Representatives and the Senate in an attempt to increase students’ knowledge about the Constitution.